Visnea mocanera also known as mocan is species of plant that belongs to the Theaceae family. Visnea mocanera is threatened by habitat loss and can still be found in locations, such as Portugal and Spain. The fruits of mocan are consumed fresh and in different drinks in Spain, due to their medicinal and nutritive properties. 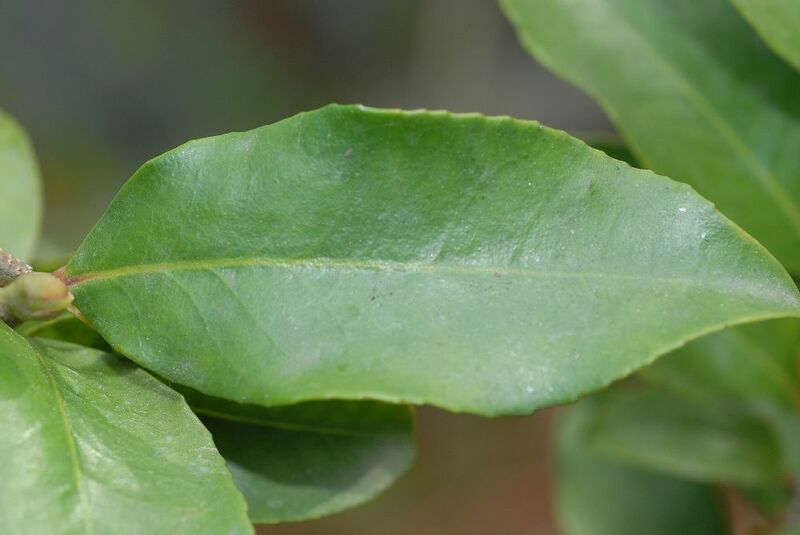 Its leaf (Pic 1) extract can also be found in one very popular bodybuilding supplement. We went through a few studies and tried to determine what purpose it serves. A neuropharmacological study by Mateo and colleagues  conducted on mice suggest that the methanol extract from the leaves and the syrup from the fruits appear to have a psychostimulant action. Visnea mocanera leaf extract (at 250 mg/kg) increased locomotor activity and reduced sleep time (induced by Pentobarbital) . Researchers also noted increased anxiety in mice after Visnea mocanera leaf extract and fruit syrup ingestion which was evident in the maze test . There are insufficient evidence to justify Visnea mocanera (mocan) use for improving athletic performance. Clinical trials should be conducted to better evaluate its efficiency as a stimulant in humans. Fruits of Visnea mocanera contain small seeds on them for which analysis show a high concentration of flavanols. Extract from these seeds show high antioxidant activity . Fruits seem to be richer than the leaves in phenolic content . The presence of compounds (procyanidins, catechins, polyphenols, anthocyanins) in mocán, identified by Hernández-Pérez et al. , could account for the antimicrobial , antiinflammatory, analgesic , psychostimulant activities  found in previous studies. Toxicological experiments indicated a very low toxicity in mice . No clinical trials evaluated its toxicity. Mateo, C. C., V. Darias, and R. M. Rabanal. “Behavioural effects of Visnea mocanera extract: Psychostimulant and anxiogenic properties.” Phytotherapy Research 9.4 (1995): 299-305. Duenas, M., et al. “Phenolic composition and antioxidant activity of mocan seeds (Visnea mocanera Lf).” Food chemistry 82.3 (2003): 373-379. Hernández-Pérez, Margarita, et al. “Phenolic Composition of the “Mocán”(Visnea mocanera Lf).” Journal of agricultural and food chemistry 44.11 (1996): 3512-3515. Hernández-Pérez, M., et al. “Antimicrobial activity of Visnea mocanera leaf extracts.” Journal of ethnopharmacology 41.1 (1994): 115-119. Hernández‐Pérez, M., et al. “Pharmacological properties of Visnea mocanera L. f. extracts: screening for analgesic, antipyretic, antiinflammatory and ulcerogenic activities in rodents.” Phytotherapy Research 8.8 (1994): 465-469.